On Tuesday, May 1st, ‘Holey’ one of two owner-procured 6.134m (20ft) diameter mixed face EPBMs built by Caterpillar Tunneling Canada for the Toronto Transit Commission (TTC) broke through on the first northern heading for the Southern Tunnels Contract of the 8.6km (5.3-mile) long Toronto-York Spadina Subway Extension (TYSSE). ‘Moley’, the second TBM to get going on the project, has about 150 rings remaining and is expected to follow Holey’s breakthrough within the next fortnight. The CA$279 million Southern Tunnels Contract, which is being carried out by the MKA (McNally Kiewit Aecon) Partnership, has been split into four tunnel drives; two 1549m (5,082ft) long north headings and two 1185m (3,888ft) long south headings (see NATJ, Feb/March digital edition). 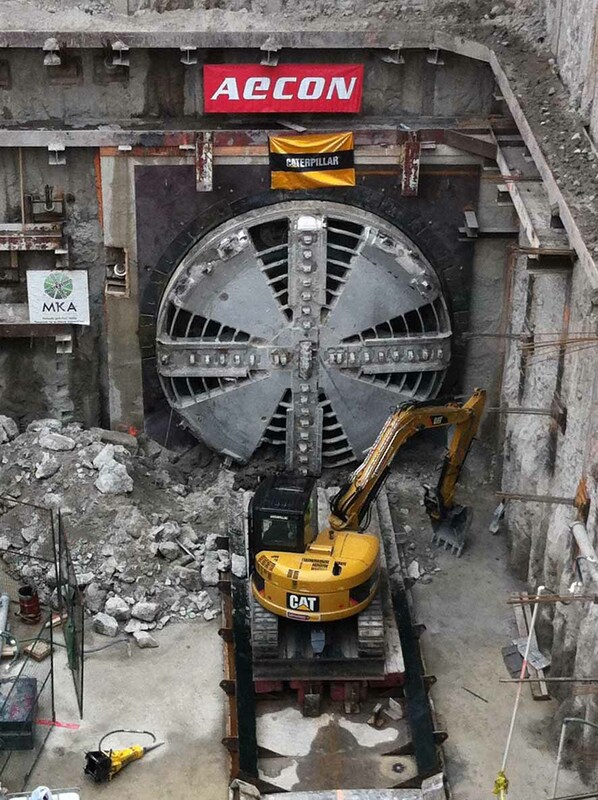 The northern headings commenced in the summer of 2011 and, despite some early challenges with the TBMs, tunnelling has progressed well with productions of up to 27m (88.5ft) per day. Some difficult areas were encountered, where due to settlement concerns, it was necessary to work 24 hours a day seven days a week. Exhausting for the crews and a logistical challenge for the staff involved, all parties pulled together and successfully completed the tunnelling through these areas. Following breakthrough into the reception shaft at Finch West Station the twin TBMs will be dismantled for shipping to a second launch shaft at the southern end of the new Sheppard West Station. The machines will then be re-launched south, towards the Spadina line’s existing Downsview Station. Cross-passage construction and concreting works will then commence within the northern headings. Tunnelling works for the Southern Tunnels Contract are expected to be complete by the end of this year. The Toronto-York Spadina Subway Extension (TYSSE), which features 6.7km (4.1-miles) of EPBM bored tunnels and six state-of-the-art stations, will be the first subway in Toronto to extend over the City’s boundary into the new corporate developments within York Region – one of the fastest growing areas of North America. The CA$2.63 billion extension, which is being funded by the Government of Canada, the Province of Ontario, the City of Toronto and the Regional Municipality of York – involving over 100 different stakeholders – runs in a north westerly direction from Downsview Station. 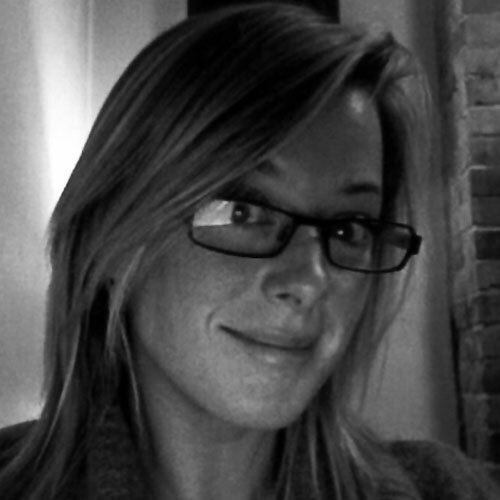 The TYSSE project is split into six construction packages. These include four separate construction contracts for the Finch West, York University, Steeles West and Vaughan Corporate Centre cut and cover stations; as well as two 5.4m (17.7ft) i.d. twin-bored EPBM tunnel construction contracts that each also include a cut and cover station to facilitate TBM mobilization (the Southern tunnels combined with Sheppard West and the Northern tunnels packaged with Highway 407 Station). HMM/Delcan/MMM Group JV holds the project management contract for the project. In October 2008, three design groups – Spadina Group Associates (Stevens Group with Alsop); Arup Canada; and EarthTech Canada (Aecom) – were each awarded the design of two stations and Hatch Mott MacDonald (HMM) was chosen for the twin-bore tunnel design. 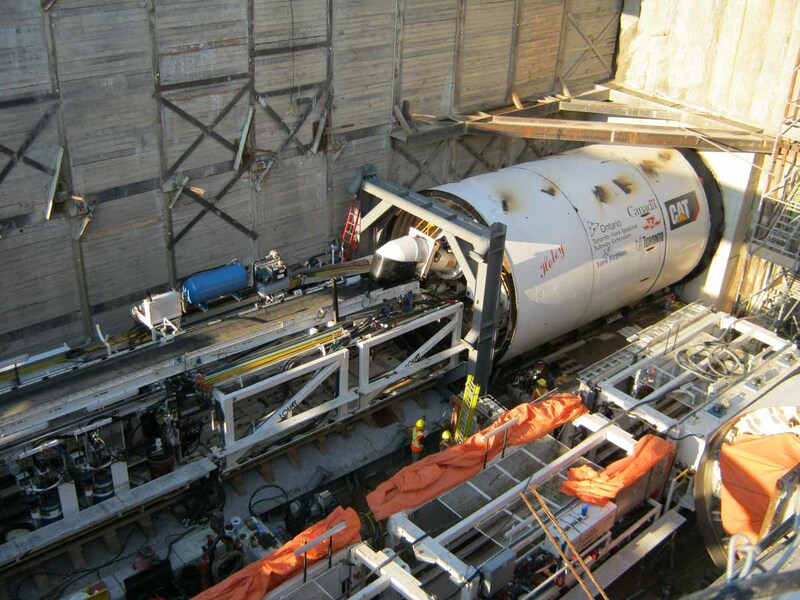 In mid-2009, following a competitive tender process, TTC placed an order with Lovat (now Caterpillar Tunneling Canada) for four 6.13m (20.1ft) diameter mixed face EPBMs and later that year Armtec Holdings won the contract to manufacture the traditionally reinforced pre-cast concrete liner rings for the project (see NATJ, Oct/Nov 2010, digital edition). The CA$405 million Northern Tunnels contract is held by the OHL/FCC JV and incorporates six tunnel drives between the new Finch West and Vaughan Corporate Centre stations, which are being driven using the remaining two owner procured Caterpillar TBMs. 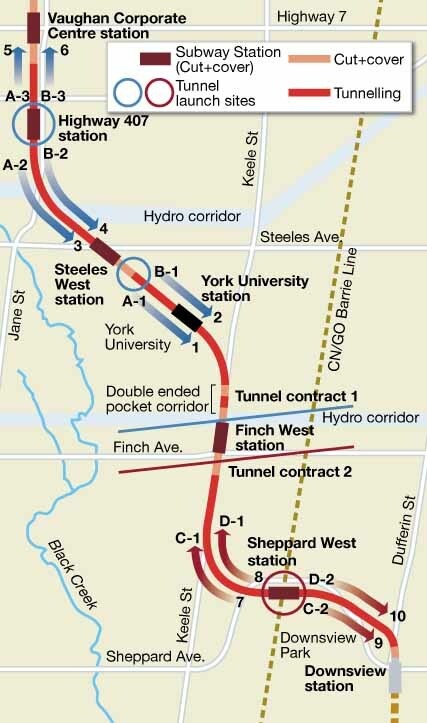 This contract also includes a 230m (755ft) long section of Sequential Excavation Method (SEM) tunnelling for a mid-alignment turn back facility within a double-ended pocket track (DEPT) near Finch West Station; as well as the first known use of compensation grouting in the Toronto area to mitigate tunnel induced settlements at York University. Running at an average depth of 20-22m (65-70ft), the vast majority of the TYSSE tunnel alignment lies in favorable geology consisting of stiff upper, and even stiffer lower, glacial till with isolated lenses of sands and silts. To the north of the project alignment however, lies the challenging geology of York Region – encountered on a number of recent sewer drives – with sands and silts giving way to layered gravels. Some of these conditions could be encountered as the Northern Contract’s drives progress towards Vaughan Corporate Centre Station. So proud of my husband (Denys Slinchenko of Caterpillar Tunnelling) who was the project manager for this TBM. Job Well Done !!! !